Going to the APA meeting? 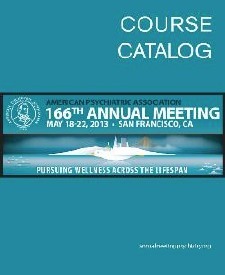 The annual meeting of the American Psychiatric Association (APA) is in San Francisco this May. I’ve attended twice before as I recall, both times when it was here. I enjoyed it, and even felt it was worth the $1000 we non-members pay to get in, although in my opinion it’s not worth doubling that for airfare and lodging to attend in another city. The presentations were generally of high quality, and so plentiful that I always found something worthwhile to attend. Up to 50 CME (continuing medical education) hours are available over five days, enough to maintain a California medical license for two years. This year, in addition to the other presentations, the new DSM-5 will be unveiled and discussed, so we can anticipate hearing a lot that is new and essential for clinical practice. Bill Clinton will give the keynote speech. Yet it’s a hard decision for me to attend this meeting. The APA and its annual meeting reflect aspects of psychiatry that concern me. In 2006 the drug industry accounted for about 30 percent of APA’s $62.5 million in financing, half through drug advertisements in its journals and meeting exhibits, and the other half sponsoring fellowships, conferences, and industry symposia at the annual meeting. Every year the annual meeting features a huge exhibit hall of lavish booths courtesy of the pharmaceutical industry. In past years I watched my fellow psychiatrists line up for branded coffee mugs and similar swag; although voluntary restrictions by the Pharmaceutical Research and Manufacturers of America (PhRMA) in recent years have curtailed this, the APA itself welcomes such giveaways according to this year’s information sheet for exhibitors. This year there are industry sponsored “Product Theater” presentations most days around lunchtime (six sessions total, up to 250 attendees per session), and “Therapeutic Update” meetings at dinnertime (three two-hour sessions) — pure marketing vehicles that are not approved for CME, that lack any pretense of scientific balance or neutrality, and that come with a nice free meal to tickle the limbic systems of the recipients. In fact, there’s a surprisingly wide range of promotional and marketing opportunities at the meeting (pdf here) that the APA sells to industry. We participants may sign up for the scientific presentations and collegiality, but the APA invites us for the millions of dollars we bring in. Of course, individual attendees aren’t forced to take a seat at a “Therapeutic Update” and may never set foot in the exhibit hall. So what’s the problem? Can’t attendees enjoy an educational experience free of commercial influence? Unfortunately, with APA selling everything from sponsored wi-fi, to plasma-screen billboard space, to branded do-not-disturb signs at the hotel, the industry flavor will be hard to miss. Registrants are warned that our names, titles, mailing addresses, and email addresses will be “shared” (i.e., sold) to meeting exhibitors. Perhaps there’s an unpublicized opt-out I’m not aware of. Whatever one thinks of this blizzard of advertising to a highly selected, captive audience of over 10,000 psychiatrists, it hardly needs to be said that the practice of psychotherapy will have no deep-pocketed sponsorship; healthy nutrition, exercise, lifestyle balance, and introspection will enjoy no “Product Theater” or “Therapeutic Update.” If this year’s meeting resembles those I attended in the past, many presenters will mention the importance of psychosocial factors in mental health, and, if one seeks them out, there will be talks by some of the luminaries in trauma research and psychological treatments. But this will be in the context of blaring signs promoting the newest antidepressant, mood stabilizer, and anti-psychotic — which nowadays may all be the same product — and a zeitgeist of DSM diagnoses leading to pharmaceutical remedies. Speaking of DSM, the unveiling of DSM-5 ought to be interesting. DSM diagnosis is an integral part of most mental health (not just psychiatric) practice, as treatment authorization and reimbursement by health plans often hinge on the DSM disorder for which the patient “meets criteria.” Both the process of creating the new DSM-5 and its conclusions have come under repeated attack from a range of reputable critics, including the chair of the DSM-IV Task Force Dr. Allen Frances, Division 32 of the American Psychological Association (the “other” APA), the British Psychological Society, the American Counseling Association, and others. One common criticism is that diagnostic categories are being loosened (or widened), such that more patents will meet criteria for a mental disorder, and in turn more psychiatric medications will be prescribed. Dr. Frances charges that the APA treats publication of DSM-5 as a “cash cow,” citing the hefty cost ($199 hardcover, $149 paperback) of this instant and inevitable best-seller. My own feelings about the DSM are mixed, and I’m curious to see how the newest edition turned out, particularly the section on personality disorders. Despite my concern about undue commercial influence, misplaced priorities, and its controversial diagnostic manual, I plan to go to the APA meeting this year. There’s too much of value to me in all those presentations. But when I pass the anti-psychiatry protesters at the entrance, I know I will wish for some way to declare myself neither anti-psychiatry nor, despite appearances, in full agreement with the spectacle within. 4 comments to Going to the APA meeting? I often wonder if the APA could ever change from within, or if the only option for those of us who disagree with their ethics is to not be part of organized psychiatry. I get the sense that many younger psychiatrists have become disillusioned with the older generation of “key opinion leaders” and their conflicts of interest, and perhaps the backlash against the DSM-5 will lead to more psychiatrists seeing the shortcomings of over-medicalizing psychiatry. However, it seems that with the coming changes in the health care system, psychiatrists who are in the system will take on ever-increasing consultative and medication management roles, while leaving psychotherapy to less costly professionals. Ah, the age-old question: whether to join a questionable institution in order to reform it from within. Of course it’s possible, and probably the only way such institutions ever change. But as individuals we must choose our battles. Tilting at windmills (or banging one’s head against the wall) gets old fast. As mentioned above, I’m not a member of APA. However, I certainly admire anyone who joins in order to improve it. I’m not hopeful that dissatisfaction with DSM-5 will start a revolution in our field. I expect we’ll just muddle along with it. By the way, I tried posting a comment to your new blog (click “Psycritic” above), and found I had to register with Google, WordPress, or a similar service. No way to just sign with a name and optional URL. This may discourage comments, e.g., from me. Nonetheless, congrats on the new blog. Sorry you had trouble commenting on my blog. I’m still deciding whether it would be better to allow more people to comment (in which case I’d probably have to moderate to filter out trollish comments), versus letting fewer people instantly post their comments. I agree that we’ll likely muddle along with the DSM-5 and subsequent revisions; it’s just too big to fail at this point. The APA and DSM 5 will be as polarizing as Democrats and Republicans have made US politics. Loved or hated, quoted or avoided. Frankly, I hope the DSM 5 makes the APA so irrelevant that the only people who are members are retired or just entrenched academics. Be careful with those antipsychiatry zealots, they don’t add much if anything to a meanigful debate.